Brick appeals to many homeowners because it's sturdy and low-maintenance. Unlike wood, which must be periodically painted or stained, brick rarely needs more attention than the occasional cleaning. However, over many years, brick can fade. This problem can be solved with a coat of brick stain. Staining a brick facade is a time-consuming, painstaking project, but if your brick is badly faded and you have a lot of time on your hands, this is the way to freshen your home's look. Faded brick may be darkened from light pink to a dark red. Choose the brick stain. If you're simply trying to freshen the color of your home's exterior, look for a stain of the same hue as your current bricks, with a slightly darker value. You may also stain your bricks a somewhat different color -- either a different shade of red, or from red to brown, blond to brown, or some other similar color change. You won't be able to radically change the color of your brick, and you can't lighten the brick, but you can shift from one hue to another if the two colors are close on the spectrum. Open the can and stir the stain according to the manufacturer's instructions. Test your brick stain on a spare brick. If you have no spare bricks, try testing the stain on an inconspicuous place on the house, either behind a bush or in the back. Wait for the test stain to dry and view it in different light throughout the day. If you determine that the stain is right for your brick, proceed to the next step. Paint each brick with stain, using a paintbrush as wide as the brick itself. Paint each brick slowly and carefully, using one stroke, to apply an even amount of stain to each brick. Do not paint the mortar unless you wish to stain it as well. You'll need a ladder to reach the upper areas of your house. Check your weather forecast each day before working on this project, and do not paint if the forecast predicts rain. For indoor surfaces, you may use stains that are intended for other surfaces, such as concrete or wood. For a house facade, however, a brick stain is really the safest route. 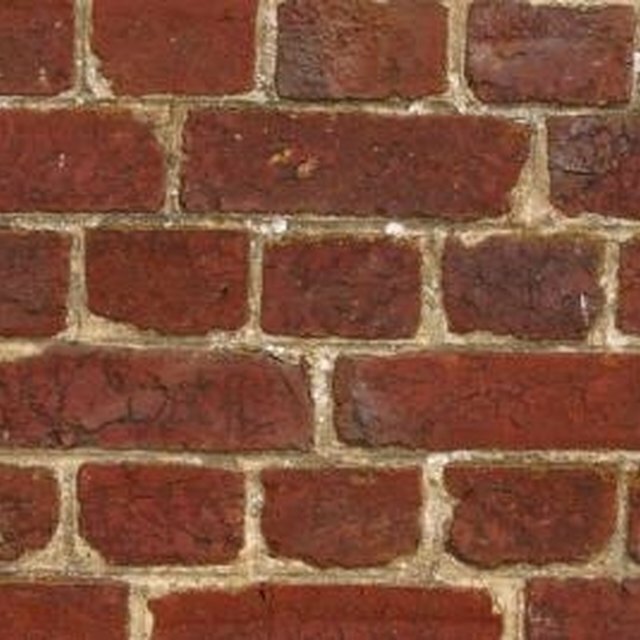 Some brick stains can be diluted to a lighter color, if the concentrated version is too dark. Follow the manufacturer's instructions. Wear rubber gloves during this process to prevent your hands from becoming stained. Stain may irritate sensitive skin.